‘Statue of unity‘ is statue of the great freedom fighter, Sardar Vallabhbhai Patel. It was launched on 31st October 2018 & it is the present World’s tallest statue with a height of 182 meters. It was praised and also faced so much criticism. It’s because of Sardar Vallabhbhai Patel, many small kingdoms joined India at the time of independence leading to the formation of the present India. So, a statue to honour him is a good idea. The statue ensures he will be remembered by the future generations also. There will be a return of investment because it is developed as a tourist spot. It will be a plus to tourism industry of India, and hence will be a plus for the economy too. Many people are criticising the move because of its cost. But the fact is that the total expenditure was not given by Indian government. Only Rs. 200 crores was spent by Indian government and the rest of the amount was given by corporate sector under Public Private Partnership (PPP). Iron used for this statue is collected from farmers of approx 5 lakh villages. This promotes unity of India. Statue of unity created employment opportunities. And as it is expected that the number of tourists will increase, it has the potential to generate more employment opportunities in the future. 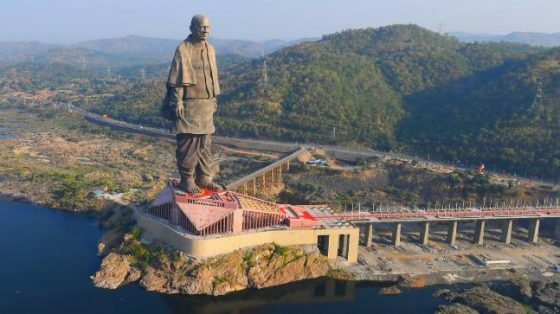 All the huge statues of the world have a wide base, but for statue of unity, there is a gap between two feet of the statue and that resulted in a narrow base. It’s not an easy task to build such a huge statue on such a narrow base. So, statue of unity is a great example of India’s engineering skills. India is still a developing country and has a lot of problems that need immediate attention such as poverty, agricultural crisis etc. It’s all about priorities. Instead of spending the amount for the problems India is facing, building a statue worth Rs. 2500 crores seems to be a foolish decision. Environmentalists are opposing the statue of unity since the beginning because this project is a threat to the ecologically sensitive area. It’s very important the Sardar Patel need to be honored and remembered. But the way to do it matters a lot. Sardar Patel was cremated as an ordinary person according to his wish. He is a simple person and wouldn’t appreciate the move if he is alive today. There are many more freedom fighters who did not get enough recognition. Indian government should have spent this money on making statues for all the main freedom fighters with that amount. If hospitals and schools in his name were built to honor him, the investment would have helped in the development of India, and future generations will know the legacy of Sardar Patel ji for sure. Both the goals would have been achieved. There is no guarantee that it will become one of the best tourist places. It’s all about priorities. At present India needs to invest in human development, poverty alleviation, improvement of agriculture before spending that much amount in honouring our leaders. Developed countries followed this principle. But it was already built. So, it’s better to put an effort to make it as one of the best tourist spots in the world to at least get return of investment. What is your opinion on Statue of Unity? Do you think it is worth the investment? Express your thoughts in the comment section below. Subscribe to our blog to receive notification whenever a new post is published. Yes,this is true the statue of unity is great honour given by nation to Sardar Vallabh Bhai Patel,but we also know that they are down to earth person they don’t want these things to be paid to him for his work or scarifice for nation. He was always against these things rather he like to do is work for people problem,poverty malnutrition unemployment.so person who concerned with this statue should aware of priorities what Our country is facing.if we want to pay tribute we can open hospital education institute or public places in memories of Sardar Vallabh Bhai Patel . On the positive side, that statue attracts a lot of tourists and improves the tourism industry of that state. It is one of a kind statue as it’s the tallest statue in the world. So many people come here to see that statue. Lot of businesses improve because of increase in tourism thereby increasing businesses in state. But on a negative side tourists have less interest in visiting a developing nation. So yeah I guess there are many negative aspects regarding the statue. For a developing nation, I guess government need not spend that much on a statue. So in my perspective the government made not so good investment in building of the statue. Government might have used that money for other purposes. But the decision is planned by eminent people who were chosen by the people of the country so we shall wait and see what is going to happen in the future. According to me i am against statue of unity – we everybody aware the greatest contribution of Sardar patel for our present India so there is no requirement to make statue and many other freedom fighters are there in India , they don’t have any statue . Sardar patel statue is the world tallest , people will come to visit the spot but in India lots of tourists spot are there , may be this is not the best tourist spot. According to me in India there are several issues are there first of all eradication of poverty and lack of education. If Govt has desire to people remember sardar Patel then can set up hospital or school in the name of sardar Patel for poor people free of cost rather to set up a statue. It’s a wastage of huge amount. If people wants to remember anybody for his contribution they will remember don’t need to set up a statue. I am favour this topic. So stature of unity is made for the remembering for that the unity is made by the sardar vallabhai Patel . This statue is made for the memories of sardar vallabhai Patel . 1.it shows the unity of india because at the time of independence sardar vallabhai Patel making many small kingdom to present India . 2. It also create a employment opportunities because it is the world tallest statue I think this place bacome a famous tourist place . 3.the total amount are not invested by govt but it is public private partnerships project. 3.after the inguration in the first 10 more the 15million people’s visit . So I think this is good initiative taken by the government to attract foreign people’s to visit in India . All the time you do something and it will worth every time that’s a myth. It’s a great example of state of the art technology that not only shows the courage of those designers but shows the dedication,devotion and hard work.It has already been made, so instead of encouraging them if you criticise then it will be very difficult to hold their intetest. How prudentially it has been made to generate revenues also shows better intellects. Each and every thing has its own importance at its own place. You expressed very well…but do you know about the conditions about the existing hospitals and medical colleges? Doctor to patient ratios is not proper,quality is lacking and also the basic equipments they don’t have …so instead of making the statue to make new hospitals is totally senseless.